John A. Primomo, M.D., is a board certified, fellowship-trained, bariatric and minimally invasive surgeon. Dr. Primomo specializes in primary and revisional weight loss surgeries, anti-reflux operations, hernia repairs, and general surgery. He is a native Texan, born and raised in San Antonio, Texas. Dr. Primomo completed his B.A. in philosophy at the University of Texas at Austin and then attended medical school at The University of Texas Health Science Center at San Antonio. He completed his residency at the University of Rochester, New York, where he received numerous teaching awards. He then acquired additional expertise at Baylor College of Medicine in Houston with a minimally invasive fellowship focused on bariatric surgery as well as advanced laparoscopic surgeries to treat reflux disease. 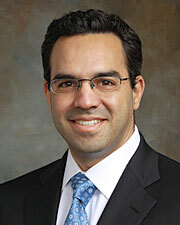 Following completion of his fellowship, Dr. Primomo joined The Davis Clinic in 2010. He is currently an assistant professor at McGovern Medical School, is certified by the American Board of Surgery, and is a Fellow of the American College of Surgeons and a Fellow of the American Society for Metabolic and Bariatric Surgery.